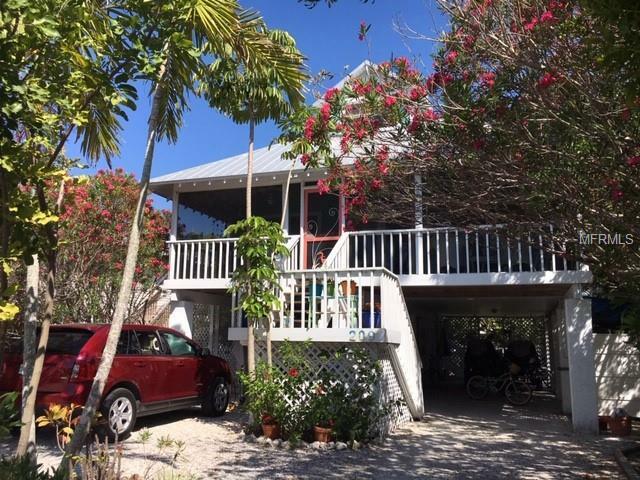 Just the prettiest Key West style 2 bedroom/2 bath Island Home. Centrally located - just over a block to the Gulf beach and three blocks to historic Pine Avenue. A wonderful wide screened in front porch complete with wood beams ceiling fans and a porch swing provides comfort ambiance and additional gathering space. Pine flooring throughout the open living area vaulted ceiling and beachy colors and decor make this a true island cottage retreat. The loft area adds additional sleeping and/or office space. Some furnishings may be negotiable. An ample storage room and carport are beneath the home. The fenced backyard provides plenty of room for a pool. Nearly $20000 in rental income currently on the books for 2019. Fresh paint and landscaping are in the works.